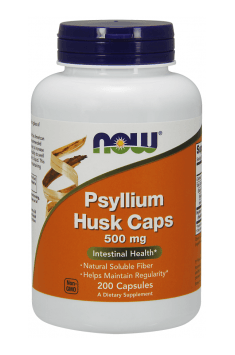 Psyllium Husk Caps 500mg 200 caps. Take 3 capsules with 250 ml of liquid 2 to 3 times a day. Plantago indica is extremely rich with dietary fibre. It is estimated that a majority of society consumes too little fibre. Preventively, it is a good idea to take 3 capsules 2 to 3 times a day. Supplementation should begin with 1 serving (3 capsules) and gradually increased to 3 servings a day taken several hours apart. When supplementing, please remember about an increased demand of the organism for water. Each serving of the supplement must be followed by a large amount of water (at least 250 ml). The preparation cannot be combined with other supplements or medicine, as the presence of dietary fibre will inhibit their absorption. If you are currently taking pharmaceuticals or other dietary supplements, take them at least an hour before or after this product.